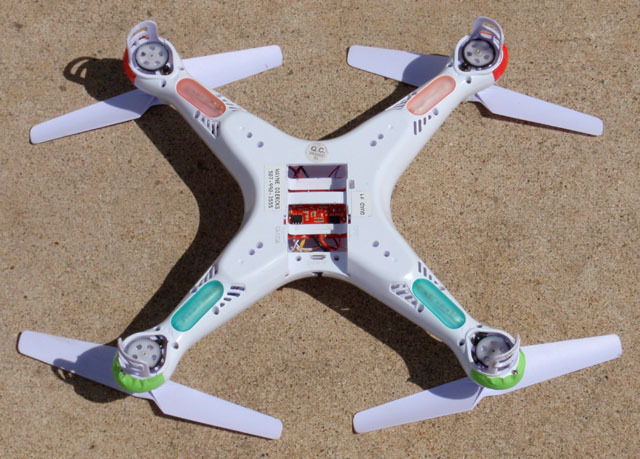 Have you ever wondered if flight performance of the SYMA X5C-1 quadcopter could be improved through lubrication? Since the coreless motors themselves are sealed and the shaft from the propeller to the large main gear is essentially inaccessible, this leaves only the meshing of the two plastic gears to experiment with lubrication. These plastic or nylon gears already appear to be very efficient. But, I (and others) have always wondered if some form of lubrication could noticeably improve performance. However, for me the number one priority is “do no harm”. That means that only dry lubricants would be considered since wet lubricants attract sand and grit. In a previous article of “Battery Flight Times for SYMA X5C-1 Quadcopter”, I detailed a consistent and scientific method of comparing flight times. 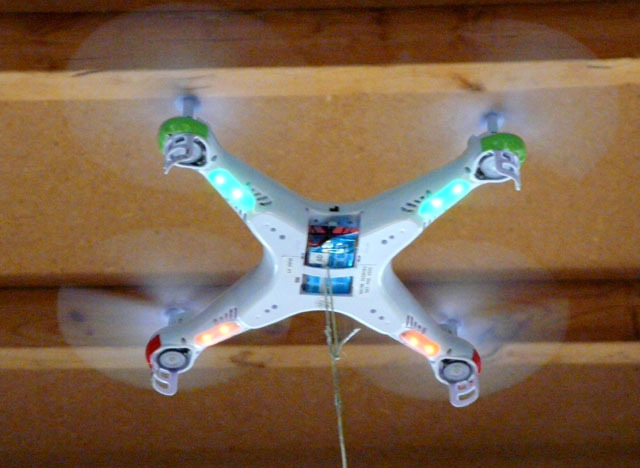 In summary, I tied the quadcopter to a brick using wax kite string to just barely hover indoors (garage) about 6 feet off the floor. I was then able to make valid comparisons by timing each flight with a stopwatch. I had two identical quadcopters for these tests that I flew in the “naked” configuration where the prop guards, landing skids, camera and battery door were all removed. Using the same battery in all my tests to insure accuracy, I found that both quadcopters flew for 9 minutes and 50 seconds in the “naked” configuration (no prop guards, landing skids, camera or battery door) before any lubrication was applied. If a method of lubrication worked then flight times should increase significantly. In my quest to find different types of dry lubricants I narrowed the field down to three graphite-based lubricants and one wax-based lubricant. Before applying them I decided to spray each of them on a similar plastic to that of the gears. I found that my nearly new recycling bin cover matched quite well while providing a good background color to perform a visual test of their properties after application. It is a good thing that I did since the Lock-Ease Graphite Lock Fluid on the far left never did dry as advertised. It merely had graphite flakes mixed with an evaporating carrier fluid so that it could be sprayed from an aerosol can into a lock or other crevice. This carrier fluid never completely dried as can be evidenced by the runs and by my horizontal finger smudge the next day as shown in the photo. So, this product was eliminated from further testing. Do no harm. The Powdered Graphite Lubricant in the puff tube differed from the rest as it is applied and remains in powdered form, which has no adherent properties in my opinion and probably falls off almost immediately. 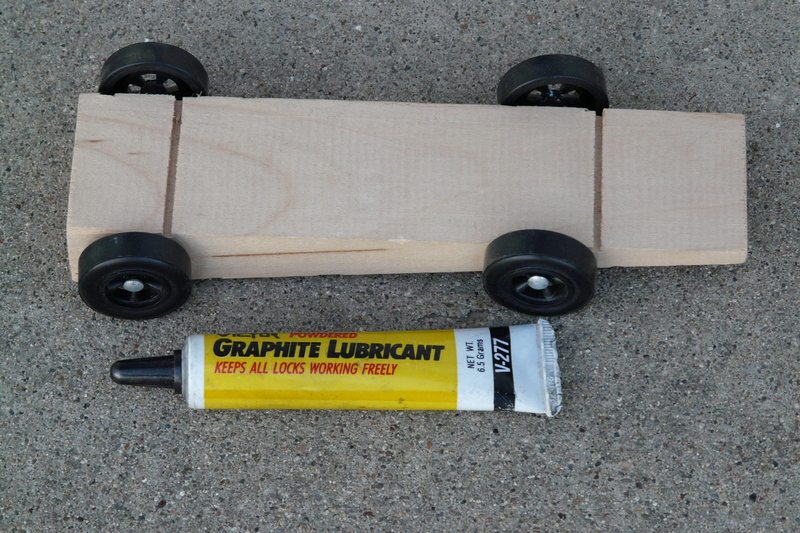 I had experience with this product (as did many parents) in preparing Pinewood Derby racecars in Cub Scouts. Applying the graphite to the axles just before each race produced a gray colored racetrack in no time. The Blaster Graphite Dry Lube can best be described as gray graphite paint. It acted just like paint and dried in just minutes when applied in a thin coat. I found this product at Home Depot while looking for a similar product made by CRC, which I never did find. 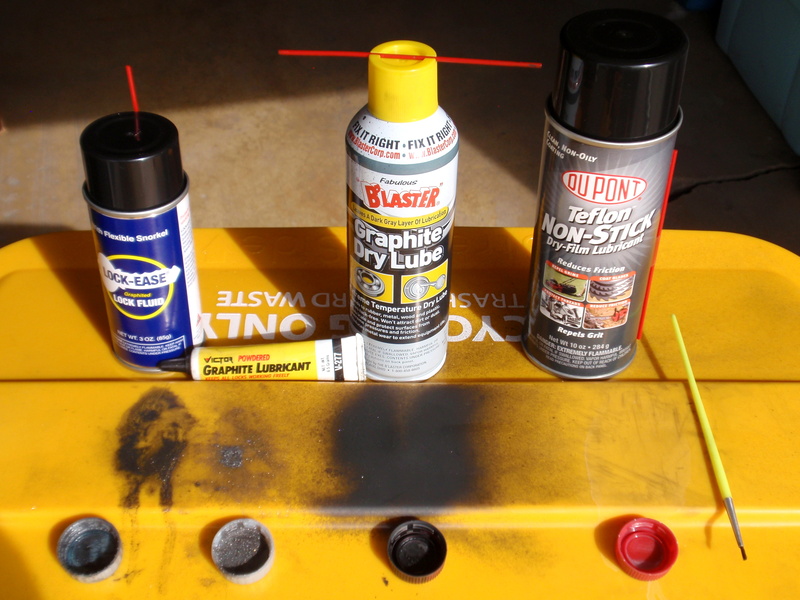 The DuPont Dry Film Lubricant on the far right was a whitish, waxy liquid that dried fully after a couple hours. It ran some at first but later retained a dry, waxy coating on everything it contacted. I decided to apply each lubricant to the gear teeth using an artist paintbrush since spraying from the can would get all over everything, ruining the looks of my white quadcopter. Furthermore, I decided to carefully mask each of the four gear modules and even the face of the main gear to further prevent a messy outcome. This required a great amount of time and painstaking work. Do no harm. The end result was the entire small pinion gear received lubrication but only the teeth of the main gear did due to the masking. Once again, I did not attempt to lubricate any other components due to difficulty reaching the gear shaft and the sealed motor case. 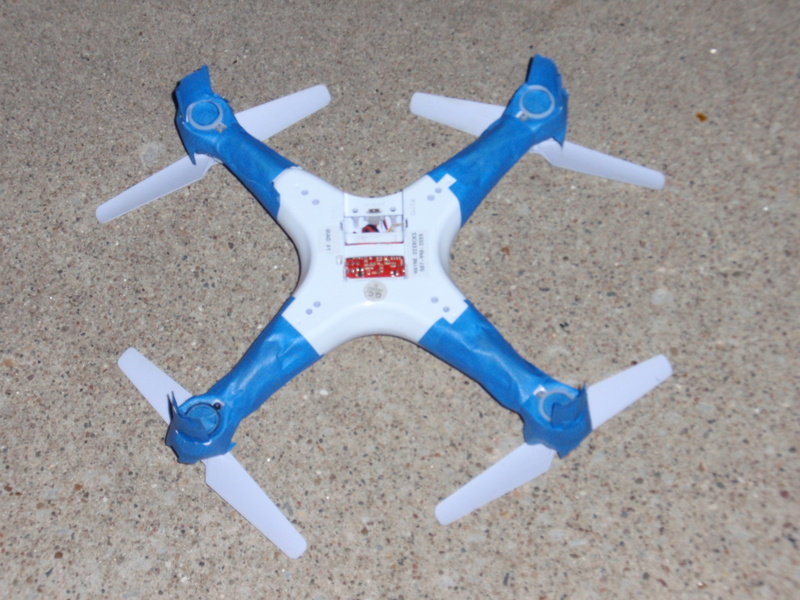 First, I applied the DuPont Dry Film Lubricant to quadcopter number one. This was the product that I was really pulling for to win the competition since it is relatively harmless, being a whitish clear wax and being easy to apply with little mess. Do no harm. After allowing overnight to dry, I performed my string hover test. The result: 9 minutes and 50 seconds. There was no discernable difference although I perceived that the quadcopter ran a bit quieter. Possibly, it was the “placebo effect”. Then, I applied the Blaster Graphite Dry Lube (gray, graphite paint) to quadcopter number two. This was the product, which I felt had the greatest chance of success. It required a bit more care to prevent discoloration of nearby parts. The result: 9 minutes and 40 seconds. Certainly there was no performance improvement although once again I perceived that the quadcopter ran a bit quieter. Just to be fair and complete, I then applied the Powdered Graphite Lubricant (again masked and with an artist paintbrush) to quadcopter number one after many flights in between to wear off any remaining wax from an earlier test. I always felt this product had the least chance of success since I believed that it lacked any method of sticking to the plastic gears. Even so, any graphite that clings to other parts of the quadcopter will show a gray discoloration so care of application was needed. Do no harm. The result: 9 minutes and 40 seconds. Again, nothing to write home about. After the flight the gears were less gray than before indicating that most of the powdered graphite had probably fallen off as predicted. So, the winner is: Compressed Air! A can of compressed air and a toothbrush for use before the first flight of the day is the best preventative measure to keep sand and grit from clogging the gears. Along with inspection before each flight, they will add longevity to the delicate, coreless motors powering the gears and provide greater enjoyment for years to come. Sometimes in research we do not get the results we want. I spent the time and effort and believe that I covered the gamut of possibilities to a “solution without a problem.” Still, it is comforting to know that the plastic gears in the SYMA X5C-1 are as good as it gets. You can’t improve on perfection. Thank you for your interest and reply. I have watched with interest most of the posts on the X8C at the SYMA Multirotor Facebook Group. I have no doubt that it is also a great value although at about twice the price of the X5C. However, I have no plans to buy one in the immediate future due mainly to my poor piloting skills. I have had my X5C for barely over two months and it is the first RC I have ever flown. Furthermore, I have concentrated on research and articles (more on the way) so much that I have gone through three motors without yet becoming fluent in changing orientation. The weather was also not conducive early on. Even though photography is a hobby, I have only recently started using the camera and find it quite good for my needs when in bright sunlight. Also, I may be interested in jumping into a mature FPV model when the time comes. So, I am not yet ready to move up in danger level until my flying improves. I have taken great interest in the new Xiomi Yi camera which is a GoPro knockoff at half or a third the price depending on the model compared. It lacks accessories at the moment but that will change. It can even directly transmit FPV. I may buy the camera first and then buy something to install it on (lol). But again, thank you for your reply and all the best to you. Great test, I wish you did it earlier though, would have saved me about $25 worth of stuff I bought. Pretty much everything you bought! It definitely runs quieter, and flying behind my house sometimes I think the neighbors appreciate that. I have used Dupont Teflon Silicone Lubricant, it runs quieter. I haven’t performed any tests in duration of flight, but after using it, it seems to hover better (more stable). Thank you for such a detailed explanation of how to properly care for a Syma drone. 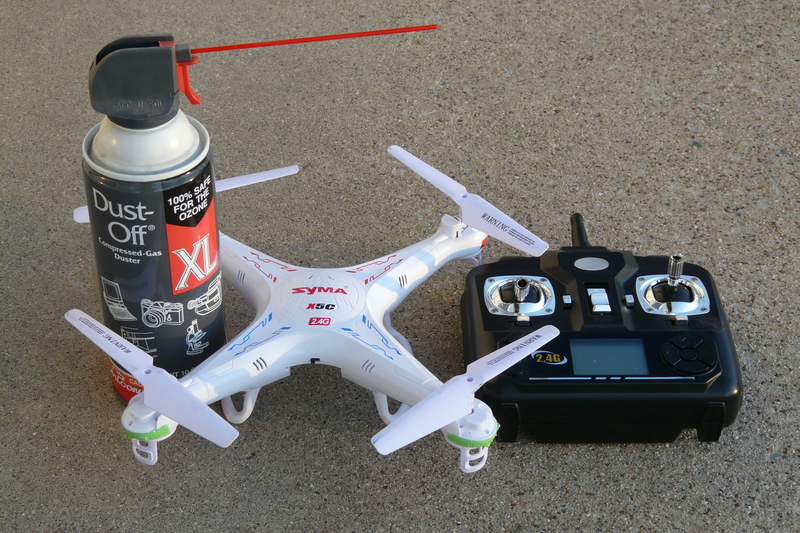 I’ve had my Syma X8HG for a few weeks now and was wondering if any type of wwt or dry lubrication would benefit my drone. I have new rotors arriving today as “backups” in case of any rotor failure. I’ll continue to use my compressed air and soft toothbrush to properly maintain my device before each flight. I am just entering the recreational drone hobby, and I see this is an old thread, so maybe no one will see and respond. Anyway, I had also wondered about lubrication of the drone mechanics, not just the gears. Thanks to those who have answered questions on that topic. But also the coreless motor bearings need lubrication I would think. I have prolonged the life of many kitchen and bathroom fan motors by re-lubricating the wick bearings from time to time, especially when squeaking is heard. But those little bearing on the drone motors don’t have wicks to my knowledge, only the very small amount of lubricant that is in the brass (or bronze) bearings from the factory. Could there not be a way to use a pin or needle to apply a tiny amount of sewing machine or 3-in-one oil to the bearings after so many hours of flight to prevent them from frying? Has anyone tried this? Just a thought; I plan to experiment when my drone arrives. Ron S.
May be an old thread but I just now am looking at it so for the benefit of others here are my 2 cents. I know engines of very low power, friction can be the enemy, such as a stirling. Graphite is much better than oil but still may not work well. 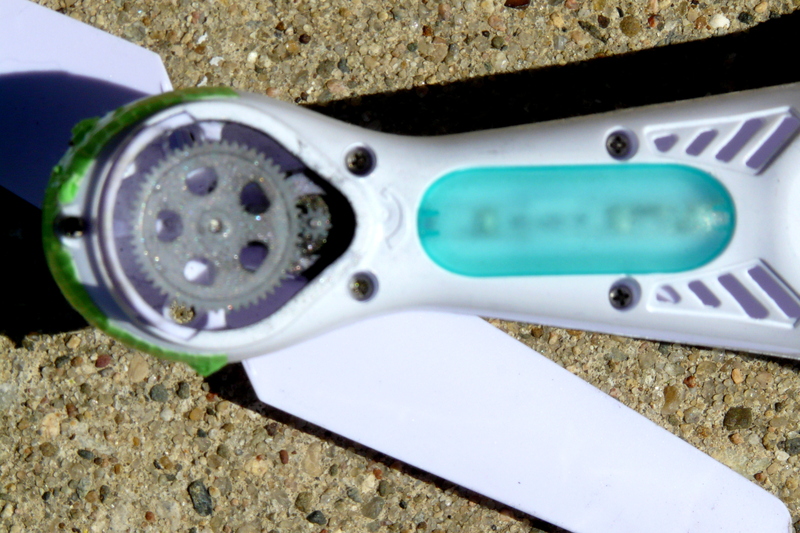 Some plastic gears have Teflon within the plastic itself. Should have proper end play so gears can mesh properly. I believe mine had too much. A hard bounce in shipping or on landing might cause the motors to move in the holder too. Will wear out teeth more quickly. Compressed air sounds like a winner to me too.